Freeman was born 1958 in Hong Kong. He studied in Hong Kong Polytechnic, and joined SS Design & Production in 1982, becoming Art Director in 1985. In 1988, Freeman was invited by Mr. Kan Tai-keung to join his company, forming "Kan Tai-keung Design & Associates Ltd". In August 1996, Freeman's name was incorporated in the company's name to become "Kan & Lau Design Consultants", he is now the Partner of the company. Since 1984, Freeman has won over 250 awards in overseas and local art and design competitions. They include Silver Award in the International Book Design Exhibition '89, Leipzig Germany; the Apple Distinction Award and Gold Award in Hong Kong Designers Association Biennial; Bronze Award in Typodirection '93 in Tokyo; Gold Award in Mercury Award 1993, New York; Grand Prize in the 3rd Seoul Triennale Exhibition of Asian Graphic Poster 1997, Korea; Outstanding Graphic Designer - the Louis Cartier Award of Excellence in 1995; Artist of the Year 1997 as Graphic Designer awarded by the Hong Kong Artists' Guild; Ten Outstanding Young Persons 1997; Porsche Design "Creative Energy" Award 1998; Golden Bee Awards 2000, Moscow; the Singapore Design Award 2000; Grand Prix of the International Poster Biennial, Taipei 2000; Grandprix (The Mayor of Nagahama Prize) of the Japan Poster Grandprix 2000; and "Outstanding PolyU Alumni Award 2001", organised by the Federation of the Hong Kong Polytechnic University Alumni Associations. In 2001, Freeman was invited to participate in the poster design competition of the "Beijing's Bid for the 2008 Olympic Games". His design was awarded First Prize and was produced as an official promotional medium. Subsequently, the poster design also won the Best Sport Poster in Lahti Poster Biennale 2001, Finland. In 2003, the Korean Society Experimentation in Contemporary Design awarded him during the 5th Seoul Triennial Exhibition of Asia Graphic Poster. 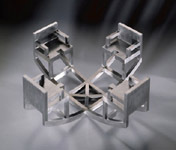 Most recently in 2004, Freeman's design for the Watson's Water won the international "Bottledwaterworld Design Awards". In his design for this bottle, Freeman successfully created a symbiosis between art, culture, design and business acumen; significantly increasing the brand's share of market while contributing to the local cultural movement. Freeman has been a committee member of the Hong Kong Designers Association (HKDA) since 1989. He was the vice-chairman of HKDA in 1992 and 1993, 1996 and 1997, chairman in 1994 and 1995; the founding committee member of "Design: Hong Kong". Freeman also concerns about the education and art development in Hong Kong. He lectures frequently in Hong Kong institutions, and has been invited by overseas organizations for lectures and exhibitions, including the 1st World Logo Design Biennial in Belgium. Freeman is also a Part-time Lecturer in the Department of Fine Arts, The Chinese University of Hong Kong; The Design School, The Polytechnic University of Hong Kong and the Institute of Vocational Education. He often provides his professional services to organisations such as the Friends of The Earth, the World Wide Fund for Nature Hong Kong and the World Vision-30 Hour Famine. Ms. Mei Ng, Vice-Chairman of the Friends of The Earth's Board of Governors once said, "Freeman is truly a Friend of the Planet Earth". Freeman is now the Chairman of the Board of Directors of Hong Kong Design Centre, Secretary General of Hong Kong Federation of Design Associations and member of the Design Management Institute Advisory Council. Freeman exerts genuine assertiveness in fine arts. Freeman was awarded Champion of Sculpture Section in Philippe Charriol's Modern Art Competition in 1992, the Contemporary Hong Kong Art Biennial Award 1994, the Urban Council Sculpture Design Award 1994, the Urban Council Fine Arts Awards 1998 and commissioned work of arts in the "Public Art Scheme Competition Exhibition 1999"; "Competition on Design of Decorative Works of Art", Hong Kong Central Library and "Mural Design Competition", Hong Kong Heritage Museum. His works of fine arts are included in private collections and collections of the Arezzo - Museum of Contemporary Gold Jewellery Art in Italy, Hong Kong Museum of Art, Hong Kong Urban Council and the Hong Kong Heritage Museum. His inherent talents in art was further recognised as he was awarded Winner of the 1997-98 International Fellowship and Residency Program, organised by Mid-America Arts Alliance & United States Information Agency. On the other hand, his recent works has been exhibited in The 8th International Shoebox Sculpture Exhibition, organized by the University of Hawaii Art Gallery; "Artists in the Neighbourhood Scheme II - People o Chair: Works by Freeman Lau", organized by Art Promotion Office of LCSD; and "Of Ink and Chairs - Kan Tai-keung + Freeman Lau, Art and Design Exhibition" at both DDD Gallery, Osaka and Shizuoka University of Art and Culture. Two works of art were commissioned in 2001, the "Public Art Project - Installation of Public Artworks at Yat Tung Estate, Tung Chung Area 30-31", organised by the Leisure and Cultural Services Department and through the "Competition of Commemorative Relief Design" at Sir Run Run Shaw Hall, The Chinese University of Hong Kong. In 2004, Freeman's work was awarded "Chair of the Year" in the Chair Design Competition of Barrie Ho Collections.